On Friday 2nd November our exhibition Sugar vs the Reef? opened at Artspace, Mackay’s regional gallery. We spent the days prior to the opening installing the show with the support of the wonderful gallery staff – Tracey Heathwood (director), Alicia Stevenson (exhibitions curator), Lauren Turton (exhibitions officer), Billie Jo Ogilvie (public programs), Wanda Bennett (public programs) and the many volunteers who offer their time and energy. The exhibition has been a long time coming and gives us the opportunity to connect the art community with the agriculture community at a local level. We have used the gallery space to showcase some of the components of the Watershed Botanic Gardens Land Art Project and the broader Sugar vs the Reef? project that Watershed sits within. Having an exhibition in a gallery after three years of working ‘in the field’ has made us think carefully about how to represent the social, cultural, and environmental aspects of a wide-ranging project. We have tried to do this by zooming in and zooming out, from small details to large overviews. Also, to give a sense of what is essentially an outdoors project, we are offering artist talks both at the gallery and at the Beacon in the Botanic Gardens. Meanwhile, our dual crop of sunflowers and sugarcane in the Beacon is coming along nicely. 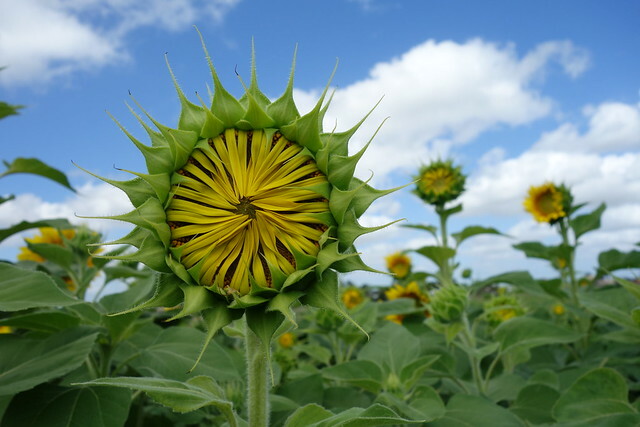 So nicely, in fact, that the sunflowers are beginning to bloom earlier than expected. This is a consequence of the dry weather – the sunflower plants are wanting to bolt to seed to ensure the survival of the species. 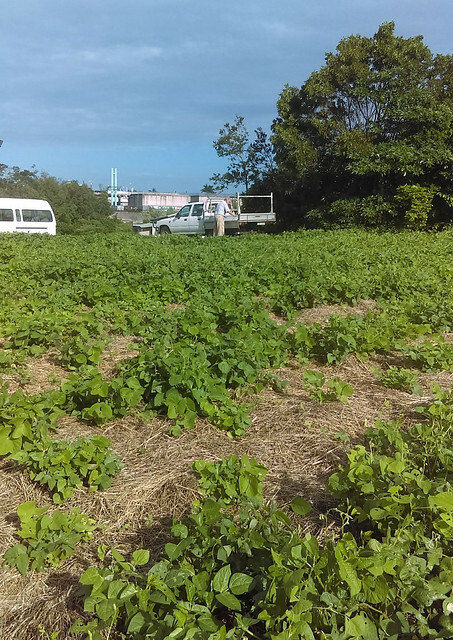 We bought a couple of soaker hoses – Jemal Davis, our colleague from the Mackay and District South Sea Islander Association, has dedicated much time going back and forth with his Job Active crew to move the hoses around and pull any weeds that emerge in the crop. The soil has been moistened and softened by the water and we’re now trying to find a balance between getting enough water to the plants but not so much that the tall, top-heavy sunflowers fall over in strong winds. Some of the plants are now two and a half metres tall, after only seventy days from planting the seeds! So, the past week has been spent moving back and forth between the gallery and the Beacon, nurturing both sites towards their deadlines – the opening of the exhibition on the 2nd November and the sunflower harvest event on the 23rd November. Jeremy Smith, (Director, Community, Emerging and Experimental Arts) from the Australia Council has come to Mackay to open the exhibition. 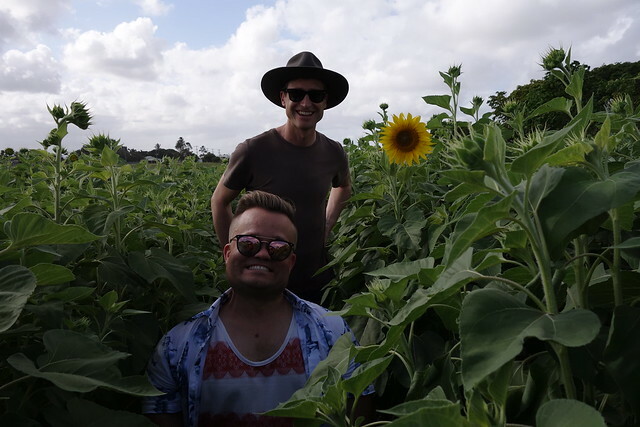 To give him a sense of the project, we took him to the Beacon on the day of the opening to give him a chance to get amongst the sunflowers. 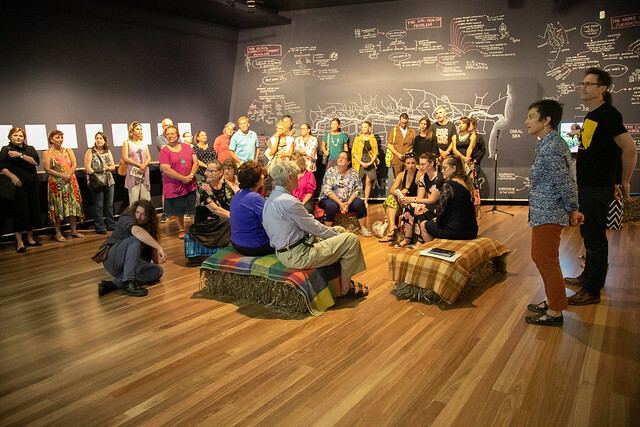 Opening night was attended by a diverse group of Mackay residents, with farmers, Australian South Sea Islanders and elders from the Yuwibara indigenous custodians amongst the art-loving crowd. 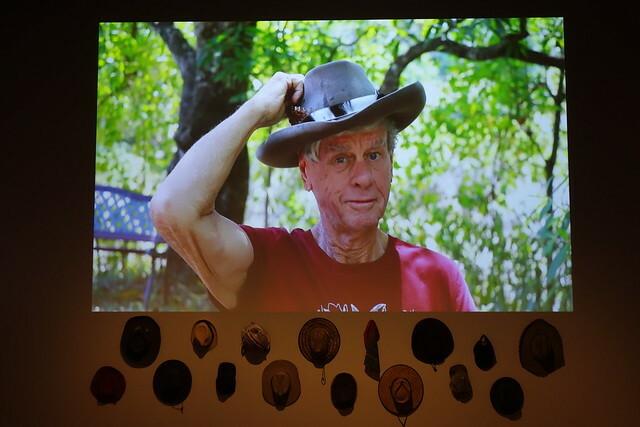 Uncle Philip Kemp gave a Welcome to Country, and we also took to opportunity during the official proceedings to present John Sweet, our environmental elder, with a new hat to tide him over the summer while his beloved hat resides in our exhibition. For children, the Hats of Mackay work has been a favourite. It provides a fun opportunity for guessing which hat on the wall belongs to which person in the video. 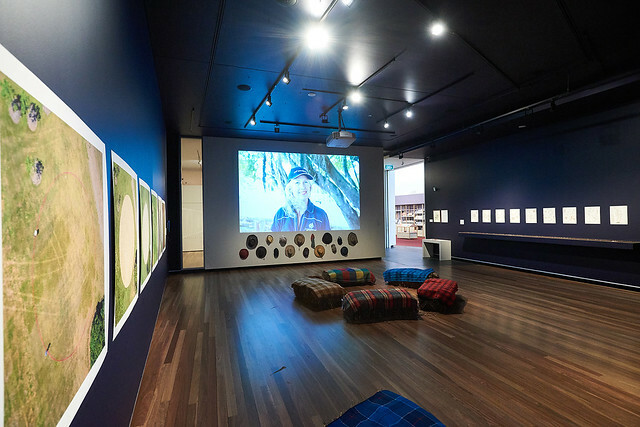 John Sweet dons his Akubra in the Hats of Mackay video work in our exhibition. The hat itself hangs on the wall along with the fifteen other hats in this work. 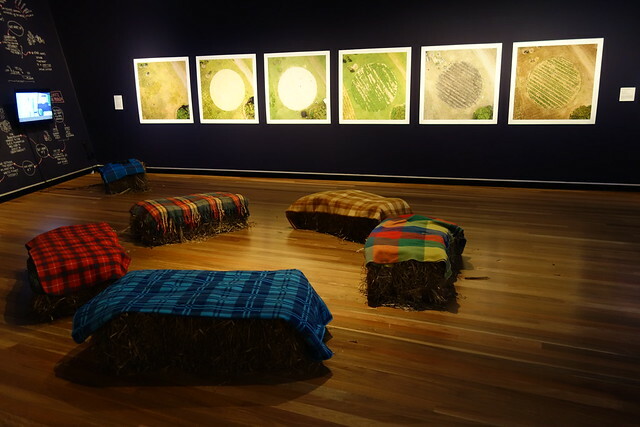 Holding an exhibition at a gallery has provided us with a new platform for discussion about the role of regenerative agriculture in the sugar cane industry. 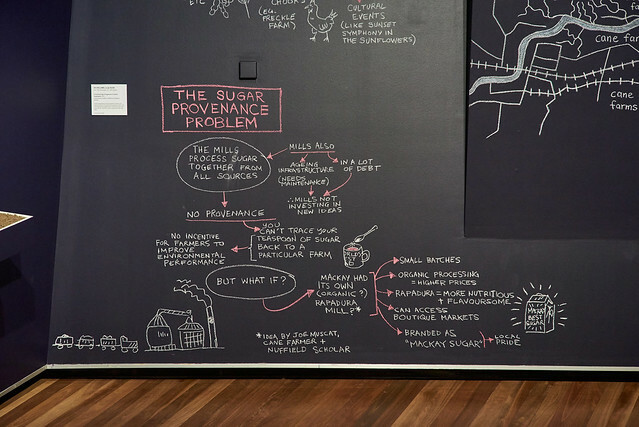 The “social ecology” hand-drawn diagram that occupies an entire wall in the gallery outlines five key “problems” that we have identified since first coming to Mackay and possible “solutions” to these problems. Lucas has conceptualised this elegantly through his characteristic word-map method. The word-map, in its entirety, talks about issues such as sugar provenance and the global commodity market, soil health, climate change and the Great Barrier Reef. All of these issues are inextricably tied together, which is what makes working in this field so rich and so complex. 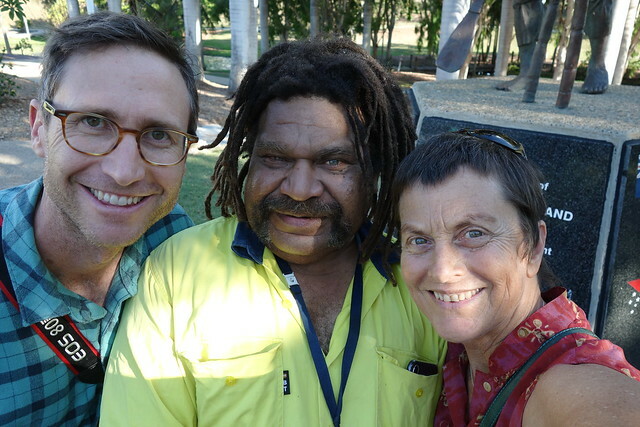 The diversity of the territory that is mapped in this work is matched by the diversity of people with whom we’ve been getting to know, work with, meet with and talk with over the past few years. The work has proved to be a thought-provoking platform for discussion. We must pay our respects here to the work of Helen Mayer Harrison and Newton Harrison, pioneers of environmental art. They have never been afraid to discuss environmental problems and through conversation and poetic responses, they have offered solutions which can seem outlandish, yet logical and elegant. Using art as a platform for discussion means that we can visualise blue-sky thinking without the constraints of politics or economic rationalism. By offering simple, logical alternatives that seem possible, barriers to those solutions may become surmountable. 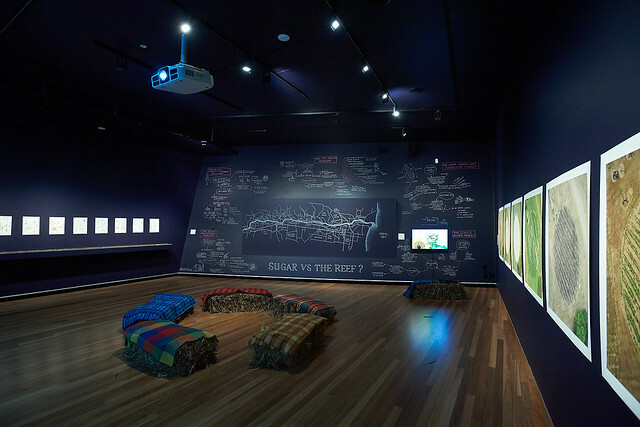 Our work in Mackay has moved constantly between indoors and outdoors: with the exception of this exhibition, our cultural events have been outdoors. The blend of culture and agriculture has been conducted around things that grow. We’ve talked, sang, worked, planted, mulched, watered, been interviewed and gathered outdoors. We’ve also talked, planned, designed, negotiated, been interviewed and worked indoors. The boundary between outdoors and indoors is porous in our world here and we move just as easily between the interior and exterior worlds of ideas and practical implementation. Starrett Vea Vea has taken photos of some interesting recent activities in the Beacon. 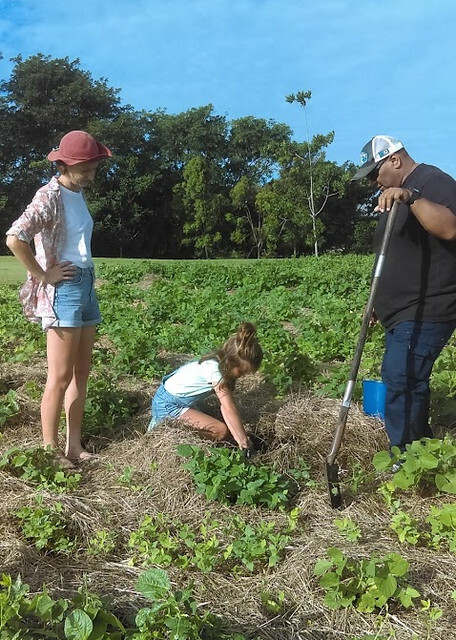 The images show John Sweet, along with Jemal, Kellie Galletly and her daughter Ruby testing the soil and inspecting the plants. They’re checking to see what’s happened in The Beacon since we began preparing the site in February by ripping, mulching, applying lime and biofert and planting several legume species. Since the planting event in late February, the legumes have come up quickly with the hot weather and rain. One of the legume plants is pulled up to check the root system for the rhizobia nodules. 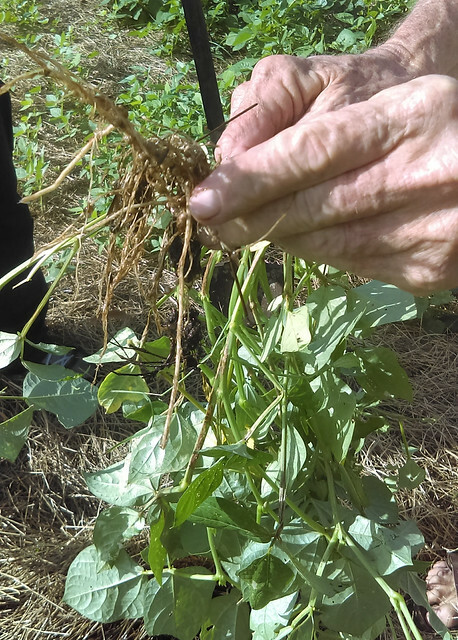 They’re there – this is a good thing, as rhizobia bacteria fix nitrogen when they’re present in the root nodules of the legumes. Ruby is doing the hard work, while the adults look on. 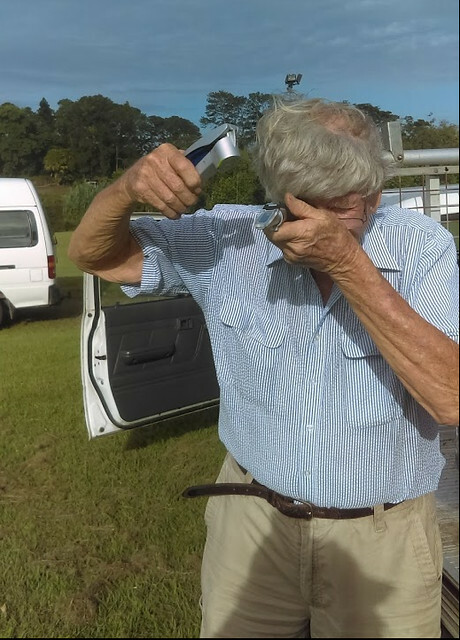 John measures the sugar content of the plants with a refractometer. To do this he washes the refractometer plate with distilled water. With a garlic crusher, he squeezes some juice from the leaves of a legume on to the glass plate. John then takes a reading of the sugar content in the sap of the plant. What has this test revealed? According to John, there has been an improvement in the soil since we began working on The Beacon. We’re hoping that the things we’re doing are bringing the soil biology back into a healthy balance. If this occurs it will optimise the soil conditions for a healthy sunflower and sugarcane crop. Along with community members, we’ll plant the dual crop in early August as part of the Sunset Seed and Song event that’s currently in the planning stages. 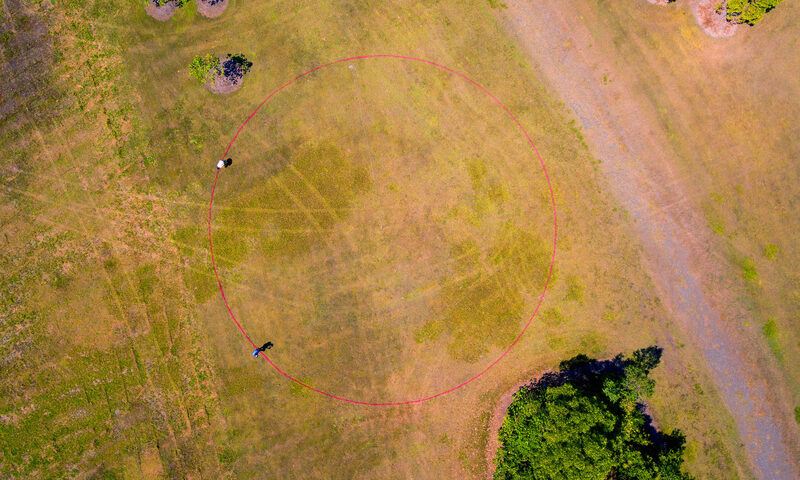 A Land Art project at Mackay Regional Botanic Gardens, with collaboration between artists, farmers, traditional Aboriginal custodians, the Australian South Sea Islander Community, and the wider community.